The phrase, “It’s a funny old game”, has been synonymous with football since long before I was born, but we’ve been given a reminder that it still rings true today when the news broke that Dundee FC had sacked their manager, Barry Smith. The decision to sack Smith is at best peculiar, and at worst, downright ludicrous. The ill-fated manager’s affiliation with the Dark Blues started way back in the mid 90’s. After breaking through to the Celtic first team as a youngster, he failed to hold down a first team slot, and made the journey north to join Jim Duffy’s Dundee side in 1995. His tenacious attitude and no nonsense style at the back made him a fans’ favourite, and an unmistakeable presence at the heart of the Dundee first XI for over a decade. He played over 400 times for the club, earning a testimonial, captaining the club for many years, and was inducted into their hall of fame. He showed a love for the club, an unshakeable loyalty that made him a success as a player, and stood him in good stead for the top job at Dens Park. Fast forward a few years and Smith jumped at the chance to take over as manager of the then 1st Division club, an acceptance that was all the more admirable given the difficulties that the club was in the midst of facing. In October of 2010, Smith took the reins. His beloved Dundee were in administration and on the brink of obliteration from football. A 25-point deduction would have consigned most teams to relegation. Can you imagine, an already financially doomed Dundee, being expected to function and survive in the 3rd tier of Scottish football? It just wouldn’t have happened. Somehow, Smith installed a belief in his players to the extent that he guided them to an unprecedented 23-match unbeaten streak. The Dee finished the 2010/11 season in 6th place. Had it not been for the 25-point deduction; they’d have finished in 2nd place, just one point behind Dunfermline. So, in a season where the club were in danger of accompanying Third Lanark and the Tennant’s Sixes in the Room 101 of Scottish Football, Smith’s men worked hard enough to effectively challenge for promotion to the top-flight, had it not been for the aforementioned bizarre points deduction. Not to rest on his laurels, Smith kept the momentum up the following season, a season that was ultimately to lead to his demise. As we all know, in the 2011/12 season, Dundee finished 2nd, with a threadbare squad, and due to the crisis in the blue end of Glasgow, were to be thrown head first into the Scottish Premier League without the infrastructure at the club to survive. It was a remarkable achievement. That team on paper had no right to finish 2nd in the ferociously competitive Scottish 1st Division, so what chance would they have, with no further investment, to survive in the SPL? They’d be like a lamb to the slaughter, and that’s exactly how it’s panned out. Smith was a victim of his own success. Had his Dundee side finished 3rd instead of 2nd two seasons ago, Falkirk would have gone up, and it’d be Steven Pressley who could be in this horrible position. Had Dundee finished 3rd that season, they’d be most likely be challenging for promotion this season. When it boils right down to it, Smith has been sacked for finishing 2nd instead of 3rd. What kind of reasoning comes into play to punish a man for his successes? And for a situation that was ultimately out of his control? Could any manager, even Mourinho, Ferguson, or Guardiola, take what is essentially a run of the mill Scottish 1st Division side, and traverse through a season in the SPL, avoiding relegation come May? I severely doubt it. The timing of the decision too smacks of indecision. Surely, if there was any hope of saving the club from relegation, the decision to part ways with Smith would have been made (ironically) around the ‘season of good will’, to allow the next manager the time he’d need to turn things around. Now, the Tayside club will face what could be their toughest challenge yet: imminent relegation to the 1st division, and in dire need of a bright spark like Barry Smith in the dugout. The danger being if they can’t find one, the downward spiral could continue into an irreparable state. All the while, Barry Smith will be unquestionably be handed the next half-decent 1st Division job that comes up, with his reputation intact, and the ability to make that club a success in the SPL. 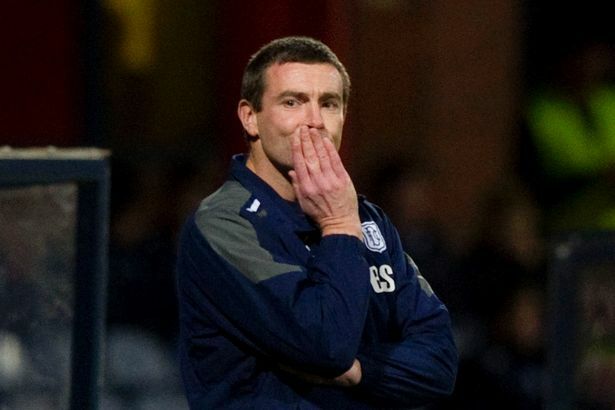 I hope for the sake of Scottish Football that Dundee don’t live to regret terminating Barry Smith’s contract. But for the life of me, I can’t see how they’d do anything but.